Catholic seminarians and religious from the north deaneries of the Archdiocese of Cincinnati recently received scholarships from the Darke County Foundation. Front row: Br. Bernard Knapke, St. Henry; Patrick Blenman, Sidney; Melvin and Mary Ann Stucke, Versailles (donors); Deacon Elias Mwesigye, Botkins; Deacon Zach Cecil, Piqua. Back row: Greg Evers, St. Rose; Lee Rosenbeck, Russia; Zacharias Schoen, Celina; Kraig Gruss, Coldwater; Brice Berger, Yorkshire; Loren Hein, Celina; Ethan Hoying, Russia; Max Travis, New Bremen; Aaron Hess, Philothea. Not pictured: Sister Mary Xavier Schulze, McCartyville; Sister Monica Marie Slonkosky, Minster; Elijah Puthoff, Russia; David Slonkosky, Minster; James Walters, Sidney. MARIA STEIN — Scholarships were recently awarded to 18 men and women from the area who are in formation for Catholic religious vocations, including priests, brothers and sisters. The North Deaneries Seminarian Fund of the Darke County Foundation granted $1,000 to every seminarian and religious from the Sidney and St. Mary’s deaneries of the Archdiocese of Cincinnati. The awards were presented at the annual Serra Club dinner for priests, seminarians, and religious on Dec. 28 at the Maria Stein Spiritual Center. The scholarship fund was established in 2013 by Melvin and Mary Ann Stucke, of Versailles. 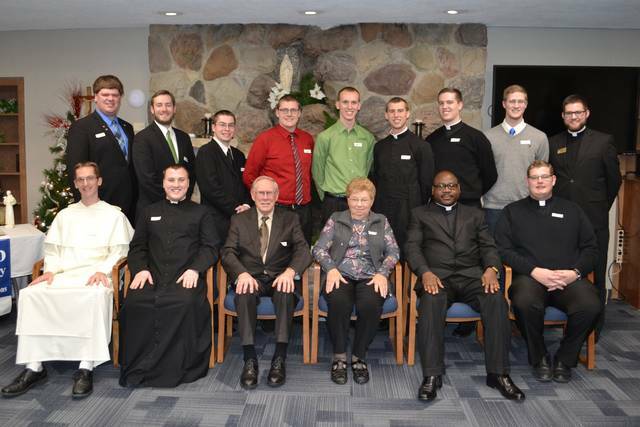 The first year, 13 local seminarians received awards of $500 each. Additional donations from the community have enabled the fund to increase the award amount. This year, 50 local residents added $17,000 to the fund. “We wanted to show students of religious vocations that we support them and are so proud of their decision to serve the Church community,” said Melvin. “Becoming a priest, brother or sister requires so many years of study and discipline that we hope these scholarships give them a little boost,” he added. As an endowment fund, the North Deaneries Seminarian Fund operates largely from investment income, providing scholarships every year in perpetuity. Donations may be made to the Darke County Foundation, P.O. Box 438, Greenville, OH 45331. For more information, call (937) 548-4673. The Darke County Foundation receives, manages and distributes charitable gifts for the benefit of area residents.